Ryan Kesler scored for the Ducks. They had won three in a row. Oilers captain Connor McDavid picked up an assist, his first point in four games, to end the longest drought of his brief NHL career. After being denied on a breakaway earlier in the second period, McDavid set up the first goal with eight minutes remaining in the period. He dropped the puck back to Russell on an odd-man break to allow the defenseman to beat John Gibson. The Ducks picked up their game in the second, though, putting 15 shots on Talbot. Anaheim tied it on a power play 18 seconds into the third period when Kesler tipped in Cam Fowler’s point shot. Edmonton had a pair of power plays in overtime and some great chances, but couldn’t score, sending the game to the shootout. NOTES: It was the first of four meetings between the Oilers and Ducks this season, and first encounter since Anaheim prevailed over Edmonton in Game 7 of the second round of playoffs last year. 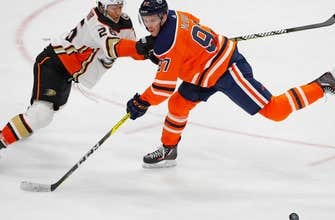 … Oilers forward Patrick Maroon served the first game of a two-game suspension for a hit to the head of Los Angeles’ Drew Doughty on Tuesday night. Ducks: At Calgary on Saturday night. Oilers: At Dallas on Saturday night.